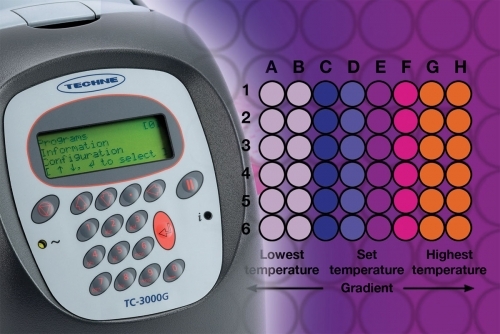 Part of the Techne range of personal thermal cyclers from Bibby Scientific, the TC-3000G gradient model offers two interchangeable block options, a gradient of up to 15ºC, and a wide choice of consumables, fast-track programming and networking capability. All these features and more are contained within a 17 x 33 cm footprint, making this the world’s smallest gradient thermal cycler. The TC-3000G gradient thermal cycler’s 48-well thermal block is arranged to provide eight columns for testing eight different temperatures simultaneously, and six rows for optimising reagents such as MgCl2 and primer concentrations. The alternative thermal block option holds 30 x 0.5 ml tubes – significantly more than the usual 12 or 20 tubes of this size. Rob Skehens, Marketing Director, Bibby Scientific, said: "The TC-3000G has been designed to hold half a 96-well plate in a horizontal format, so that a wider range of temperatures can be applied and any protocol optimised within a single experiment. The latest software enables a gradient to be added to any temperature step of the program. The heated lid of the TC-3000G is temperature selectable and also fully height-adjustable. This feature gives users the widest possible choice of consumables, including Techne’s 24 and 48-well plates and 8-tube strips, adding to the unit’s versatility." Operation of the TC-3000G is intuitive, with speed dial functionality allowing fast program location. The gradient calculator function displays the temperature for each of the eight columns, ensuring easy replication of thermal conditions. Annealing temperatures, at which primers bind to DNA templates, can be optimised over a 15°C gradient between 20 and 80°C, and the heating rate of 3.3°C per second is the fastest of all 48-well cyclers in the market, including gradient units. Utilising the USB connection, one standalone unit or up to 32 cyclers networked together can be controlled by Techne’s free Gensoft PC software.